It’s generally accepted that brands are used to differentiate one product or service from another. It’s also widely accepted that brands behave as a psychological shortcut to a whole host of associated feelings about a product or company. Recently, a 16-year study across a huge array of companies and markets, conducted by BlackRock, the world’s largest asset manager, showed conclusively that companies which have a strong brand, outperform their competitors. In other words, a strong brand brings significant additional value to the company, irrespective of how its operational elements perform. But what is it that gives one brand greater strength than another? There is so much choice and competition available for consumers to enjoy, that it’s very easy to flip from one brand to another if we experience dissatisfaction, or if an alternative appears more enticing in some way. More often than not, our purchasing choices are guided by what the brands we choose say about us, and how we want others to perceive us. In particular, millennials have a preference for strong brands with a clear sense of purpose. Embedding this clarity of purpose, as well as creating strong associations with other important values makes a brand attractive but also gives it the ‘stickiness’ that creates loyalty. In a world which is so influenced by social media, a bit of stickiness can quickly go a long way. Developing this brand strength requires companies to undergo a transformative shift in their thinking. 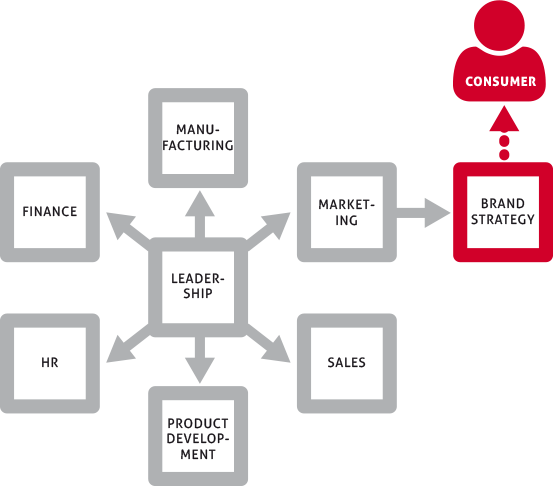 In the diagram below, a typical company is shown to have all the required facets to its operation to effectively service customers. As you might expect, the marketing department whose job it is to attract new customers, is given the task of developing and implementing the brand strategy. The graphic is simplistic, but representative of the brand strategy template that companies have largely followed since the 1990s. So how can it be that companies like Google for example, can seemingly appear out of nowhere, bust up the competition and become the one name on everybody’s lips in their category? Same for Uber, same for AirBnB, and the list goes on. Any company has the potential to achieve similar dominance and ‘do a Google.’ It’s really a question of how the brand strategy is thought about and acted upon INSIDE the company that affects how it performs outside. 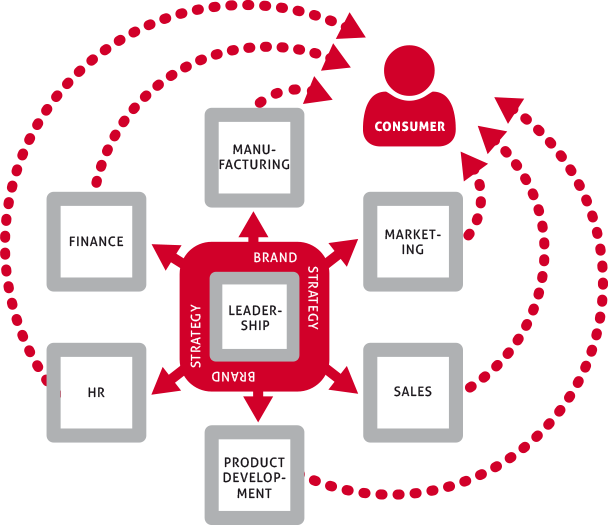 As the diagram shows, placing brand strategy at the centre of the organisation creates cohesion, strength and clarity. Everyone from sales, to customer service to packing and despatch, to accounts lives and breathes the brand. More importantly, they express this cohesive strength though all of their interactions with customers, suppliers, and when trying to attract new talent to the company. The result from the consumer’s perspective is a perfect, seamless experience. The consumer has total clarity in their understanding of what the brand stands for, no matter how many different ways they interact with the company and its products.